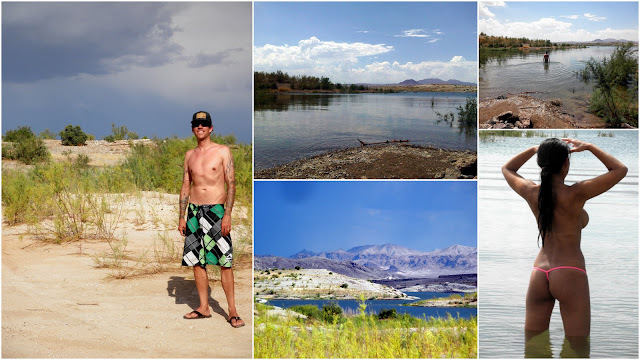 One of the first few weekends in July, after a long bike ride in the morning we escaped to the quiet shores of Lake Mead for a picnic and some time to ourselves, away from the music and buzz of people at the pools. John had read about some neat coves at the end of roads and trails that shot off the same vein on which we ride our bikes so we loaded up our coolers, grabbed our beach towels, and drove off to towards our new adventure! There are marked roads along the way to Callville Bay where we turned off Northshore Road to this cove. To get to where we were you would need a vehicle with high clearance and 4-wheel drive is recommended. There are some big and sharp rocks so make sure your car tires are in good condition and you have a spare on board. This particular afternoon could not have been more perfect. The sun was out, the air was still, and the water was calm. Across the way we could see cars parked at an old, now closed launch ramp and people on paddle boards floating peacefully. Where we were, no one was nearby to be heard and all was quiet except for the sound of fish jumping out of the lake. The water where I stood was shallow and the lake floor slowly descended in to the deeper area for over about 50 feet. I was quite surprised by the small fish around us. They appeared to be curious (or hungry) because they hovered around us all day and when I sat in the water, they nipped at the rocks around my feet. A few sought shelter in the shadow I casted on the water. It was easy to forget how long we were there without music to keep time. John napped and I had magazines to leaf through and once in a while we swam around to cool off. We probably could have hung out there all day but it was getting late in the afternoon and we had to be somewhere later that evening...I can't remember where, so we packed up. On our way out we couldn't ignore the trash scattered across the beautiful desert so we picked up as much as we could fill the garbage bag we brought with us to drop off at the dumpster the park provided near the entrance. One of the reasons we go out to the lake is to get away from the city and enjoy nature. People who litter are such lazy dirt bags. Besides seeing all the trash it was a beautiful day and time at the lake! Seems to be quite a contrast with the water day over at Mandalay. Still laying round reading magazines, getting wet periodically, but a little different sounds. Wow it looks awsome out there. Would love to go check it out someday. nice to see you in a gstring its been a while!! !